Often, amongst the subpar horror fair of late, there are the hidden artefacts you stumble across that dare to deliver something different. As part of the current renaissance in intelligent, independent horror films that have the unhinged freedom to explore more metaphysical concepts there are the hidden gems built on the germ of an idea – the less tangible…the less obvious. Often deemed to have smaller audiences, the likes of Honeymoon and The Babadook have, at their core, something deeply personal shrouded in expressionistic brushstrokes that help to convey more thought provoking ideas. Although The Babadook descended into more of a cliché, Honeymoon managed to retain its serious, speculative approach and it is the same conviction that makes Spring one of the strongest horror films of 2015. It’s a sad state of affairs that such a masterpiece has zero marketing and is only released in the UK on DVD at the bargain bin price of £4.99. With its more obvious tropes nested in the masterful tales of H.P. Lovecraft, Justin Benson and Aaron Moorhead’s second feature reminds us how a heady mix of romance can work wonders. Traditionally, these genres are not as removed from one another as we may think and have more than been taken advantage of in these Twihard years. 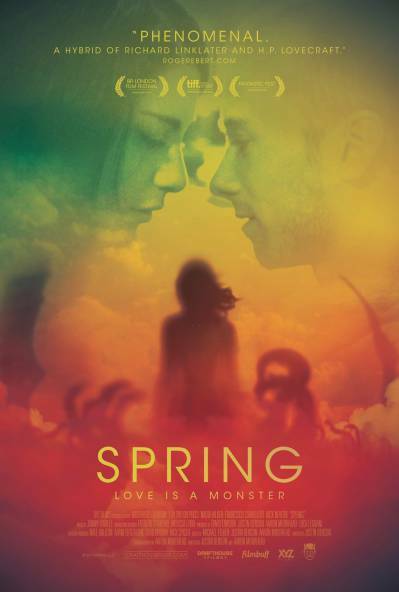 Yet Spring manages to deliver a fresh and often beguiling approach with its meandering nature and stunning scenery swaying close to Richard Linklater’s conversational piece, Before Sunrise and therefore attempts to avoid the imagery we are all too familiar with. After his mother passes away, a young bartender by the name of Evan (Lou Taylor Pucci) is left alone and angry with regret. When he prevents his friend from a potential glassing, a bar brawl ensues which results in the loss of his job. Before long his life is threatened by the hapless thug and the authorities begin their search. With nothing left to keep him rooted, Evan sets off for a random destination and ends up in Italy where he briefly meets up with a couple of cockney backpackers, secures a part time job and, amongst the wine and sunshine, meets the beautiful and alluring Louise (Nadia Hilker). As they begin to spend time with one another, it is soon clear that she hides a dark and terrifying secret that literally evolves throughout the course of the film. Comparisons to Upstream Colour can also be noted; yet where Shane Carruth’s film deals with many ambiguous themes in a more speculative light, the visual language is just as arresting. Throughout the labyrinthine streets and swell of the sea, Benson and Moorhead take their time to explore character, which enables the viewer to accept the grotesque transformations Louise undertakes. In the moments the creature is seen it is disquieting, unsettling, shocking and disturbing – each transformation exploring the familiar while still retaining a fresh direction that helps to elevate its more primordial nature. While Evan’s character deals with his estrangement from his homeland, it is during a key scene that reminds us of his unbridled love – in that no matter what happens to those closest to you, love knows no bounds; both emotionally and physically. In the opening moments of the film we understand Evan’s grief and relationship with his mother before he is cast adrift. As much as Louise is a myth, Evan is the truth behind how simple one man’s love can be.